There's no better way of catching fish than to use a float. It’s how most of us started our fishing careers and having that heart pounding moment when tiny bubbles suddenly appear in your swim, edging closer and closer to the float tip until it suddenly glides out of sight. There are rods available to suit every float fishing style – from ultra fine match rods designed for smaller river and stillwater silver fish, through to power house rods for taming hard scrapping commercial carp. 1). 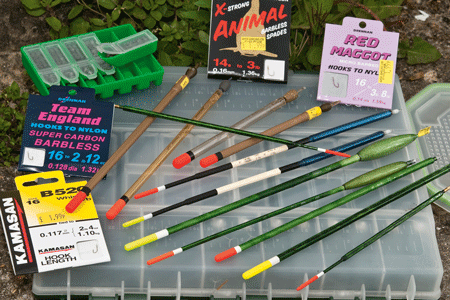 This kit is what you’ll need for a fledgling float fishing career, with many items available through tackle shops. Advice from your local tackle shop owner is invaluable – you simply don’t get such important info from ordering your kit on-line. They’ll be able to steer you towards the appropriate tackle to buy as well as recommending the best local venues for some float action. They can also provide you with the classic float fishing bait – good old maggots. 2). The business end of float fishing is critical. Shrewd fish shy away from crude hook links and oversized hooks and tying such delicately fine tuned hook lengths can take a little practice to truly master. Ready-tied hooks to nylon is the answer. There are plenty of floats to choose from too, from bodied wagglers for thumping out rigs in deeper water, through to delicate insert wagglers for registering ultra shy bites. 3). Here’s a typical range of hooks to nylon suitable for river tactics, which include finer patterns which are spot on for presenting tiny baits for keen eyed specimen dace and roach. 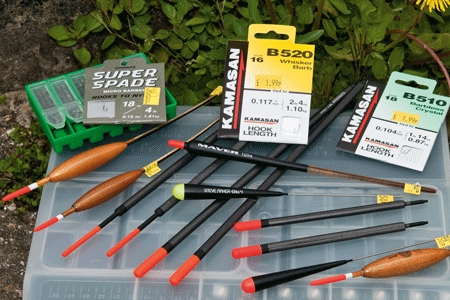 Float wise, it’s good to go river fishing with a broad choice to cover all situations. Pacey shallow glides call for dumpy patterns, while calmer stretches can be tackled using traditional stick patterns with either cane lignum or wire stems, or even straight waggler patterns. Don’t forget to buy a packet of assorted float rubbers too – they cost pence but are critical for attaching river floats top and bottom to your line! 4). Choose a 12 to 13 ft rod for river fishing with a responsive tip action for quickly setting the hook and with a cushioning action for absorbing powerful lunges from the odd monster chub. This match rod is perfect for most river fishing applications and is equally suitable on stillwaters for targeting silver fish and other species up to 8 lb. Couple that with a fixed spool reel and you have the perfect starter combo. 5). If stillwater commercial carp pools float your boat, then you’ll need a float rod with a bit more backbone and power. Standard match rods will cope with lively double-figure carp, but a stepped up waggler rod measuring 13 ft is designed to tame such hard scrapping fish and is a joy to use. Reels that feature a ‘fast drag’ allows you to loosen off the clutch super quick to let bigger specimens run without snapping you off. 6). Don’t scrimp on your main line and hook length material. The real budget stuff can often be fairly grotty and will quickly let you down. Match Winner main line is a great main line mono with a high strength to diameter ratio with superior suppleness and controlled stretch. It’s available in 100 m spools from 2 to 8 lb breaking strain.